Monday October 25th 1926 Winnie was busy with her dinner. Her friend from Austin with Mrs Given were here. Soon after dinner I took them to the picture show. It was dark when we got home. Evening resting here. 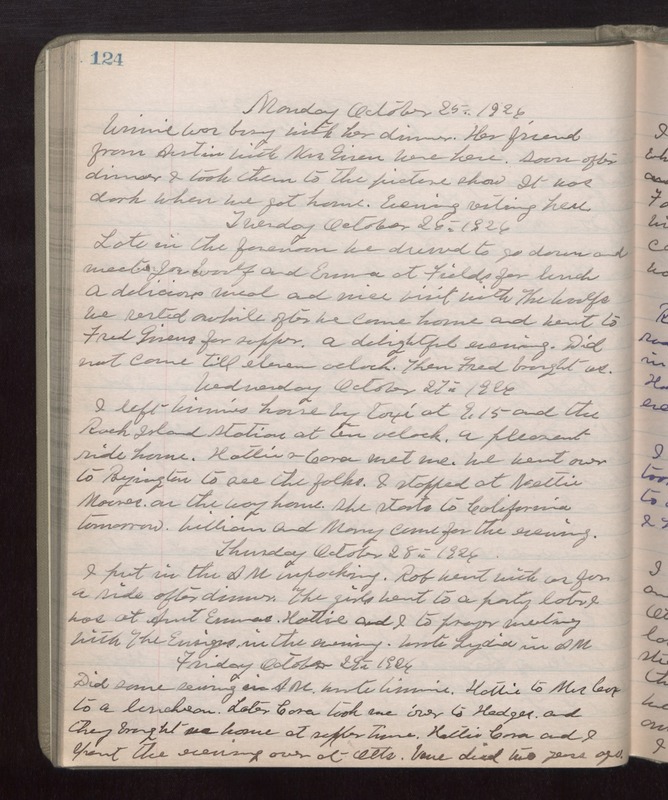 Tuesday October 26th 1926 Late in the forenoon we dressed to go down and meet Joe Woolf and Emma at Fields for lunch. A delicious meal and nice visit with The Woolfs. We rested awhile after we came home and went to Fred Givens for supper. A delightful evening. Did not come till eleven oclock. Then Fred brought us. Wednesday October 27th 1926 I left Winnies house by taxi at 9.15 and the Rock Island station at ten oclock. A pleasant ride home. Hattie & Cora met me. We went over to Byington to see the folks. I stopped at Nettie Moores on the way home. She started to California tomorrow. William and Mary came for the evening. Thursday October 28th 1926 I put in the AM unpacking. Rob went with us for a ride after dinner. The girls went to a party later. I was at Aunt Emmas. Hattie and I to prayer meeting with The Ensigns in the evening. Wrote Lydia in AM. Friday October 29th 1926 Did some sewing in AM. Wrote Winnie. Hattie to Mrs Cox to a luncheon. Later Cora took me over to Hedges and they brought me home at supper time. Hattie, Cora and I spent the evening over at Otts. Vene died two years ago.